I am Indiana farm boy, good stock, wonder what is going on here in West Africa. 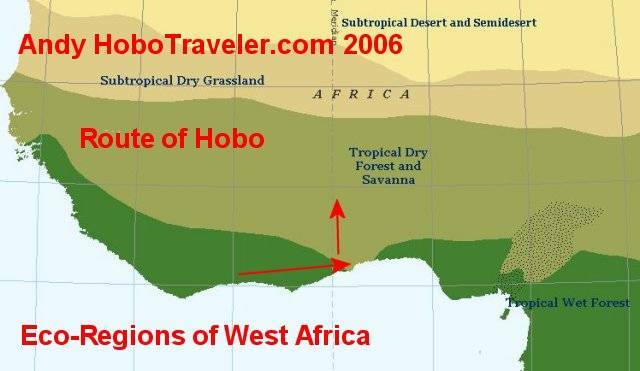 This is a map of West Africa, rather explaining the water or ecosystems of the Africa. I have been looking at maps now for a month or two, I study them, I try to access, and figure out what is going on in Africa and why they have such bad numbers. I am in a flatter part of the world, not like the farming on the side of a mountain in Peru, or Nepal, or needing 150-rice terrace as in Banaue, Philippines, this place is easy to farm, except maybe, there is too much green stuff. Are just scrub trees, like Mesquite of Texas with 50-100 times more water? I am not sure it looks like the lumbermen came in a took all the trees and cleared the land more or less, in a scrub way, scrag way, not finished, however very close. The farming appears down in between anything that involves work. If a mound is in the way they farm around it, if a tree is there, they farm around it, too much undergrowth and they farm around it. It looks like the weed get out of control, therefore they farm around it. Water and any soil and normally something grows, I see all type of fruits and vegetable here, however they have a fixation with growing tomatoes and the - Pima- a pepper that will burn you lips, just too hot for normal eating, must be diluted. Cassava and Peanuts are big, I have been teasing them about going bigger or carrots and maybe doing string beans, I can see some cucumbers, but not like the rest of the planet, a fixation on too hot peppers. I have purchased a few apples in Benin, a treat. No cultures that sit on the Equator are highly motivated. I have lived on the Equator or tropical zone for about 10 years and work is not a big desire. Beer yes, however work is low on the list of things to do, it appears that they work all the time, but more just sitting in the home-shop-work place and talking with friends. Nothing better to do anyway, and now they watch soap operas and MTV. French one here in West Africa. Permanent siesta is more a good way of looking at it here. I think we could say, we have always done this way, my father done it this, good enough for him, good enough for me. In a place where you could grow, rice very easily the import. I do not see any hunger; I see extremely crazy eating habits. People only work hard enough to get food in their belly, have a home, safety, after that, most people stop work for any excuse. I do not see 95 percent of people as wanting to work.